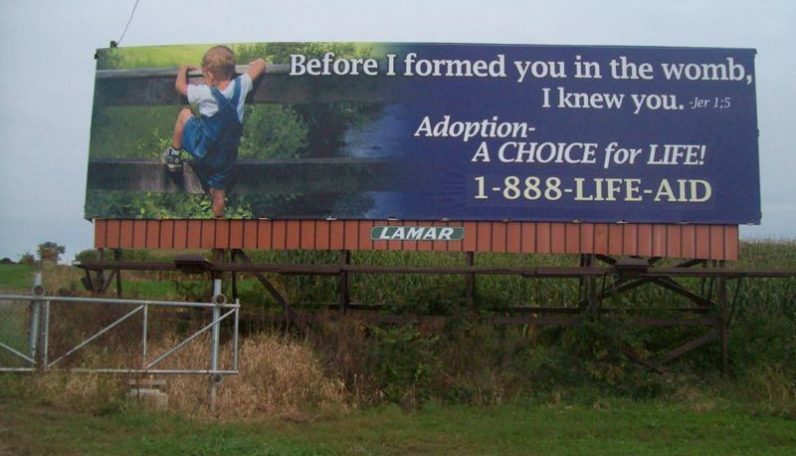 A billboard touting life-affirming adoption is displayed near the Morgantown exit of the Pennsylvania Turnpike, at the precise intersection of the Archdiocese of Philadelphia and the Dioceses of Allentown and Harrisburg. A decade has passed since a pro-life billboard was erected just before the Morgantown exit on the Pennsylvania Turnpike. The way the billboard came about and has been sustained is nothing short of a miracle, and Helen MacMinn is again looking to the Catholic faithful to help keep the billboard in place. “I’ve been reflecting on how God ordained this mission over 10 years ago,” said MacMinn, a member of the Respect Life Committee at St. Benedict Parish in Mohnton, Diocese of Allentown, as she shared the miraculous story of the billboard. The child’s picture on the billboard is of MacMinn’s grandson, taken when he was about 2 years old at French Creek State Park, Elverson. “He is a special miracle,” MacMinn said. At the time MacMinn worked in Harrisburg and each day as she drove home on the turnpike would pass this particular billboard. The Lord would clearly speak to her that this was where he wanted the picture to be used for life. “After months of his urgings I made the call to Lamar Advertising to find out what it would take to lease the billboard,” said MacMinn. The sales representative at Lamar informed MacMinn that the cost would include the artwork, vinyl and four months advance leasing amounting to $5,000. “Wow, I didn’t expect that at all. Since I had no funds to cover the cost I placed it in the Lord’s hands and prayed hard for an answer,” she said. Several weeks after MacMinn spoke with Lamar she was asked to hand out pro-life literature at the Turks Head Festival in West Chester. “I was partnered with a wonderful woman who had just moved to the area. Within minutes of talking with her she mentioned that she wanted to advertise adoption as a choice for life,” said MacMinn. “My amazement must have shown on my face because she asked me, ‘Is there anything wrong?’ Still in shock, I proceeded to tell her about my grandson’s picture and how the Lord was leading me to use it for life on the Pennsylvania Turnpike. We planned to further discuss it over lunch several days later and to my total astonishment she presented me with a check for $5,000 — praise the Lord. “I immediately called the Lamar sales representative and excitedly announced that we were ready to sign the contract, only to be told that the present advertiser had renewed the contract for that particular billboard. He explained that he was sorry, but that they had plenty of other billboards available and that he would send me a listing. Several weeks later the sales representative called and began the conversation with, “I am going back to church.” He proceeded to inform MacMinn that the advertiser had just called to cancel the contract for the billboard. “I responded, ‘I told you the Lord would work it out,’” said MacMinn. “We proceeded to design the artwork and make preparations for installation. It was just such an amazing feeling to know that the Lord had accomplished such a miracle. However, once the billboard was in place I realized that within four months I would be out of funds. The newspaper told MacMinn it would like to run the article, but they had to determine where the billboard was located and whether it was within the Diocese of Allentown. As a result all three dioceses agreed to place an article in their respective newspapers — in Philadelphia at the time, The Catholic Standard and Times — regarding the billboard, and in response MacMinn received more than 200 donations. MacMinn is again in need of funds to keep the billboard in place. To donate, make checks payable to St. Benedict’s Respect Life Committee and send to St. Benedict’s Catholic Church, 2020 Chestnut Hill Road, Mohnton, PA 19540. Tami Quigley is a staff writer for the A.D. Times, newspaper of the Diocese of Allentown, in which this story first appeared and is used here by permission.